President Donald Trump has proposed new taxes on imports of steel and aluminium. States that have a lot of exposure to steel and aluminium imports could be hit particularly hard by the tariffs. 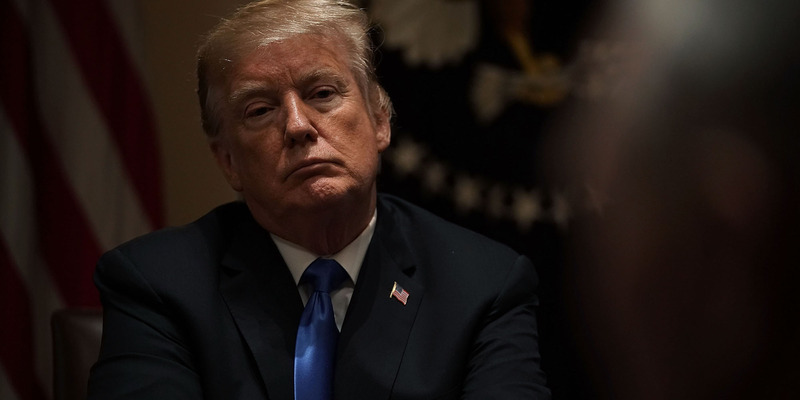 President Donald Trump seems set to implement his proposed tariffs on aluminium and steel imports, and they’re poised to affect some states more than others. Trump announced the tariffs, which function as taxes on imports, last week. The proposal calls for a 25% tariff on steel imports and a 10% tariff on aluminium imports. Several economists have warned that the tariffs could have a negative impact on the economy, with one analysis suggesting a net loss of 146,000 jobs. And on Wednesday morning, several big industrial stocks, which represent companies that consume large amounts of steel and aluminium and could see a hit to their businesses if metal prices go up, were trading sharply lower. Torsten Sløk, the chief international economist at Deutsche Bank, circulated a chart showing which states had the most to lose from the new tariffs. 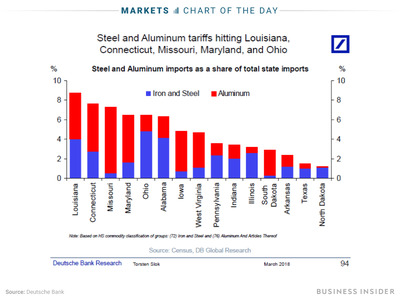 The chart shows the share of steel and aluminium among the states’ total imports, one measure of how important those metal imports were to their economies. Louisiana, Connecticut, and Missouri all seem poised to be hit especially hard if the new tariffs take effect.